DeforestACTION to go LIVE with XBOX Kinect | Collaborate for Change! Imagine if millions of people could experience engaging orangutan interactions from their living rooms. Imagine too, if they could experience it through a virtual 3D game made possible by XBOX with Kinect. What kind of reach and exposure might become possible if some of the best minds in electronic games design combined forces to build such an experience for tens of millions of people globally? Kinect is in the Guinness Book of World Records as the fastest growing electronic consumer device of all time, and provides an extraordinarily consuming experience. It is also a serious educational tool with a growing portfolio of educational apps. 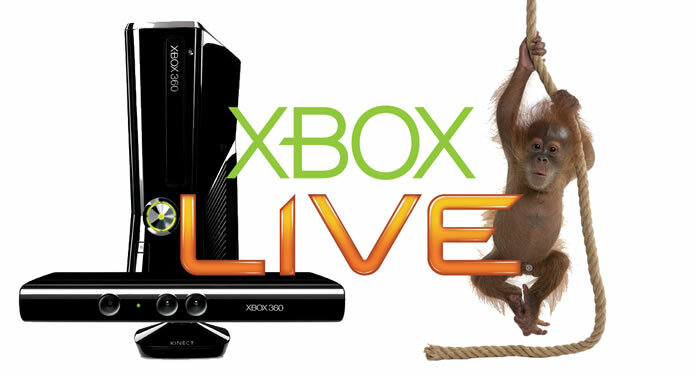 With XBOX360 now in more than 60 million homes worldwide, we are very excited to announce the development of a new DeforestACTION game to raise global awareness of the desperate need for orangutan conservation. 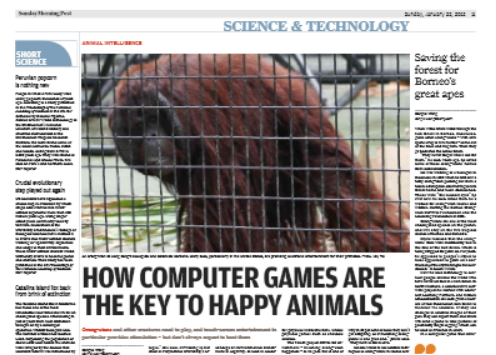 The team at Hong Kong Polytechnic’s M-Lab school of design have been working on a concept of orangutan interaction games for the past year. In these games, humans can already play against real (and simulated) orangutans incorporating a range of spatial awareness and memory challenges that orangutans can typically compete (or beat) humans at. A recent article from the Sunday Morning Post in Hong Kong. By taking such a game concept mainstream we can ensure more people become respectful of the exceptional intelligence and diverse personalities orangutans demonstrate. As players increase their awareness, they are likely to get involved in supporting their plight and actively oppose the forces of deforestation that are rapidly driving them to extinction. With the broadcast power of XBOX Live, and some of the most creative and experienced minds on the planet (commercial, private and institutional) combining on this project, this is sure to be a powerful driving force for conservation awareness and recruitment. Below is an extract from a related article in the Sunday Morning Post in Hong Kong. Ready for a game? You will be shown a sequence of five different pictures. Sometimes the pictures are abstract shapes, sometimes faces. Sometimes the faces are rotated. Memorise them: you have five seconds. Go! Now tell me what they are in the correct sequence with 20 pictures to choose from. If your competitor was an orangutan, it would probably beat you at this game. “The orang-utan has such good visual memory,” says Dr Hanna Wirman, the developer of this computer game made specifically for orangutans. They often have visual memories several times greater than humans’ due to the intricate paths they have to carve out and remember in a forest of similar-looking trees. And they will win even if the images are turned 180 degrees, because orang-utans are often upside down. “They are sensitive at recognising images no matter how they are rotated,” Wirman said. zoos and wildlife rescue centres, could show visitors just how smart orang-utans – which share about 97 per cent of our DNA – are. Wirman has a PhD in cultural studies from the University of the West of England in Bristol. We will keep you posted as the game development unfolds. got a great idea for this game? We would love to hear it in the comments below.